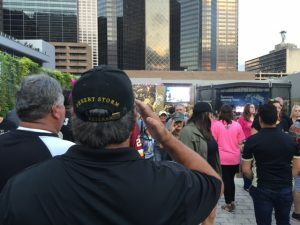 Game 16 – Warrior Wishes Come True On A Record Breaking Night In New Orleans! 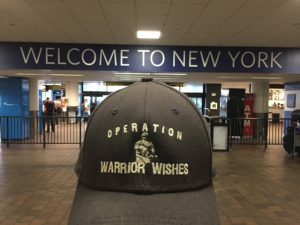 My dad kicked off this week on Thursday night & made Warrior Wishes come true in New England. 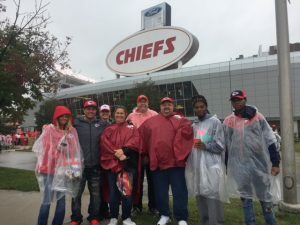 He stopped home for less than 24 hours and took an overnight bus Saturday night from Chicago to KC to host warriors in the rain at the Chiefs game yesterday. 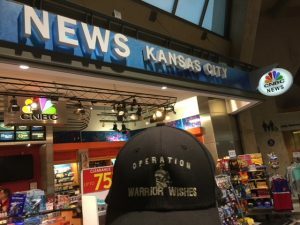 And spent last night at the Kansas City Airport to catch his early morning flight to New Orleans to make Wishes come true at the Monday Night Saints game! Unfortunately, when my dad arrived in “the big easy,” it was still raining. I don’t think he had dried out from the day before… Thankfully the saints play in a dome! Upon arrival, my dad got to work finalizing plans for the day. 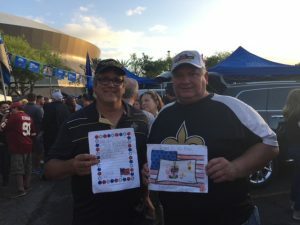 Today we had the honor of hosting Air Force Veteran Bobby Lovergne & Desert Storm veteran Perry Mueller at the Saints game. 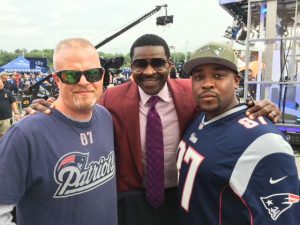 My dad met up with Bobby & Perry for dinner before the game at Walk on’s sports bar. They enjoyed getting to know each other over some delicious Jambalaya & Pecan Pie! 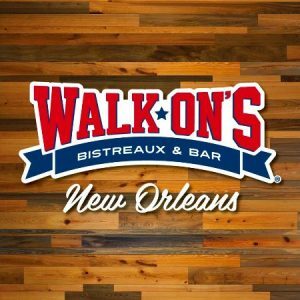 Walk On’s is the place to be on gamedays! There’s really no better way to describe the uniqueness of Walk-On’s Bistreaux & Bar. They start every dish from scratch and use fresh ingredients to bring mouthwatering, Cajun cuisine to life. And whether you’re going there for dinner with the family, date night, cocktails with the girls or to watch a game on the big screen, they’re always happy to share their Louisiana culture with you. Make sure to stop by an authentic New Orleans experience next time you are in town! 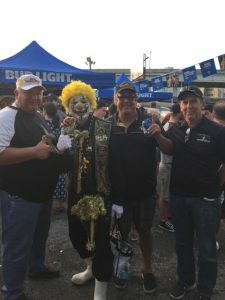 The group eventually made their way over to the stadium to tailgate with some Saints super fans before the game. There was a lot of buzz surrounding this game due to the fact that Saints QB, Drew Brees was closing in on becoming the All time passing yards leader! 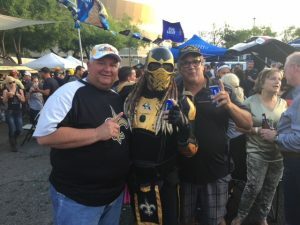 Everyone was in New Orleans was hoping history was going to be made! 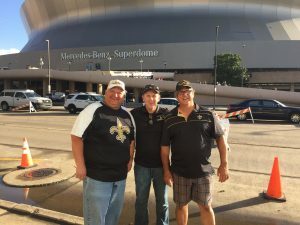 After tailgating and spending some time in “Champions Square” the guys made their way inside the Mercedes Benz Super Dome to watch the Saints & Redskins kick off. The Saints wasted little time and marched down the field & scores a TD on their fist possession of the game to take the early lead. The Redskins answered with a filed goal of their own to cut the lead in half before the fireworks began to go off in the 2nd quarter. The Saints scored 3 Touchdowns in the 2nd quarter including the record breaking 62 yard TD pass to rookie Tre’Quan Smith! The warriors celebrated the achievement & the score along with 70,000+ fans in the dome! 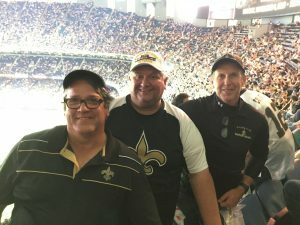 I watched the game at home and personally was cheering on Drew Brees. He is one of the best to ever play the game & an absolutely amazing person off the field too! Drew uses his “celebrity” status in all the right ways. He is a great humanitarian & and inspiration. He is a role model & an inspiration. 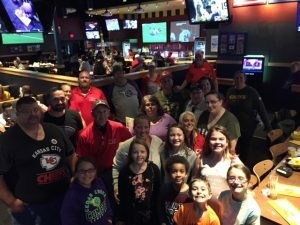 I absolutely loved Drew’s message to his kids after he broke the record. He said “You can accomplish anything in life that your willing to work for.” It was an awesome moment! It’s the truth, absolutely nothing is impossible! If you want it bad enough & work hard enough to achieve it, you can do it. The only one that can stop you is yourself! 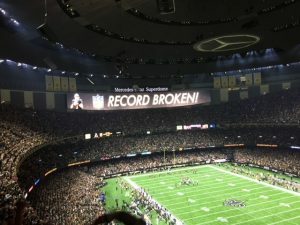 After Drew broke the record, it was all Saints! The Redskins looked deflated in the 2nd half & the Saints went on to win 43-19! 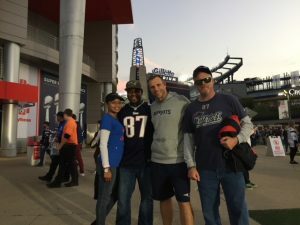 Despite the lopsided score, my dad said the overall experience was incredible! 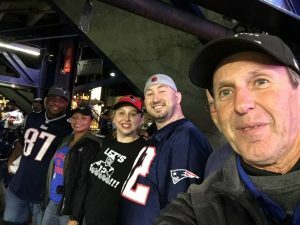 The warriors had a great time cheering their team to victory & their QB into the history books! 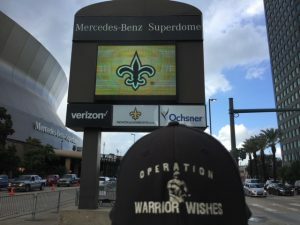 Operation Warrior Wishes would like to thank New Era for providing the Saints caps to the warriors, Walk On’s for providing the pregame meal and Ben “Cyborg” Saint for hosting the warriors at your Pregame tailgate! 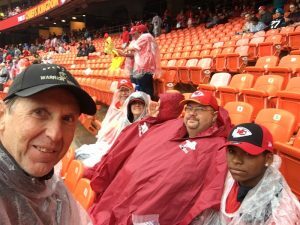 Game 15 – Warrior Wishes Come True At The Kansas City Chiefs Game!